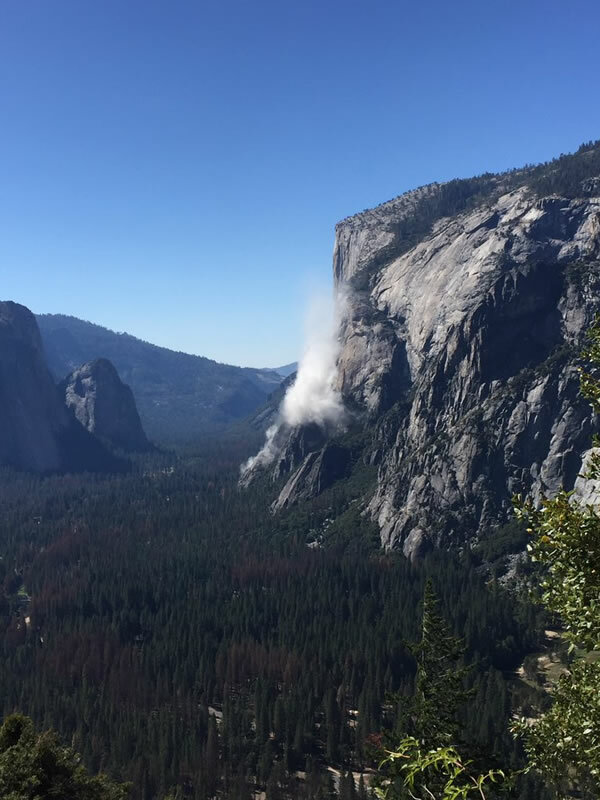 YOSEMITE NATIONAL PARK, California -- A spokesperson from Yosemite National Park says a large rock fell near the east buttress climbing route on El Capitan at around 1: 55 p.m. One person is confirmed dead, and one inured as officials continue their search for victims. A rock slide is shown at Yosemite National Park on Wednesday, Sept. 27, 2017. One person was killed Wednesday, and another injured in a rock fall on the granite face of El Capitan in Yosemite National Park, an official said. "Rocks came crashing down at the height of climbing season with at least 30 climbers on the wall," ranger Scott Gediman said. El Capitan is one of the world's largest granite monoliths towering vertically 4,000 feet (1,219 meters) from the Yosemite Valley floor. "It's the heart of climbing season," said Gediman, adding that the park bustled with visitors. "It was witnessed by a lot of people." Officials didn't say how large the rock fall was, but climbers posted pictures on social media from hundreds of feet up the wall showing a large billow of white dust moments after the crash. Mountaineers from around the world travel to the park in the Sierra Nevada to scale El Capitan's sheer face. The latest rock fall could change the cliff's contour for future climbers. Fall is one of the peak seasons for climbing because the days are long and the weather is warm. Rock falls are common in Yosemite, but seldom fatal. Yosemite remains open, and the latest rock fall doesn't affect other activities throughout the park, rangers said.